In this post: Amazing comfort food recipe for chicken pot pies with puff pastry crust that’s easy and so good! Uses a deli rotisserie chicken so it’s a quick weeknight dinner idea. 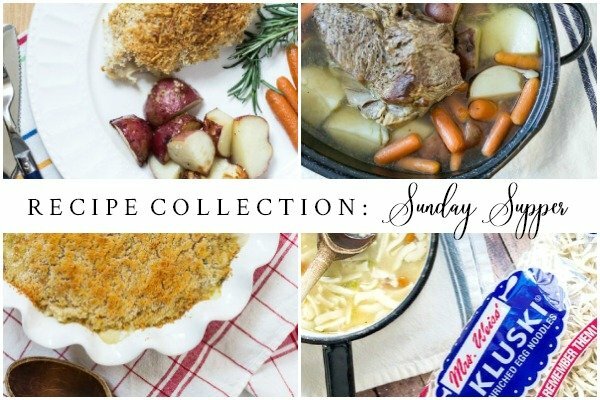 Welcome to another edition of Sunday Supper…on a Wednesday! 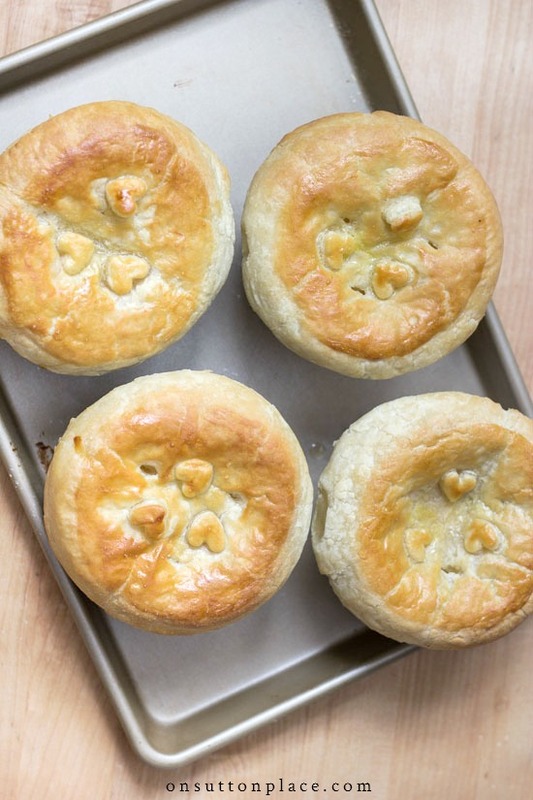 I thought I would post a few days early in case you actually want to make these mini chicken pot pies with puff pastry crust on Sunday. For this recipe, I used one of my favorite secret weapons: a grocery store rotisserie chicken. I get them at Kroger and they are amazing. I used my basic roux recipe, fresh vegetables and puff pastry. Sort of a semi-homemade approach that tastes like you spent all day in the kitchen. My ramekins are pretty big and measure 4 inches wide by 3 inches tall. I got four very hefty servings. I used a small plate to cut the puff pastry circles because my largest cookie cutter wasn’t quite big enough. If you used ramekins that were a bit smaller, this recipe would easily make six servings. To make it super easy, just make a big pie in an 8 x 8 pan. 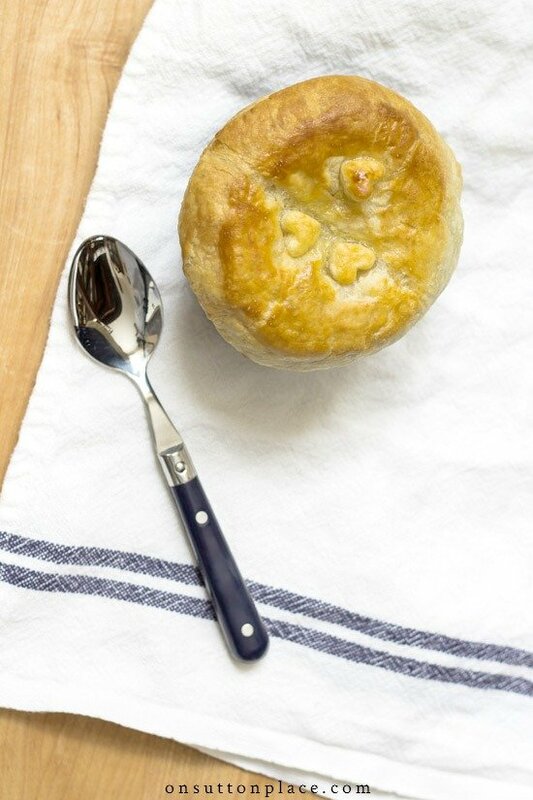 Amazing comfort food recipe for chicken pot pies with puff pastry crust that's easy and so good! Uses a deli rotisserie chicken so it's a quick week night dinner idea. Remove puff pastry from the freezer and follow package directions to thaw. Pull the breast meat off the rotisserie chicken and chop into bite size pieces. Make sure to keep the juice in the bottom of the bag. In a saute pan, melt 2 T. butter. Add carrots, celery and onion. Salt & pepper to taste. Cook until onion is clear. In a large saucepan, melt 4 T. butter. Add 1/2 c. flour and quickly whisk to combine. Whisking constantly, add chicken broth and juice from chicken bag. When well combined, add milk and salt/pepper. Whisk until it comes to a full boil. Remove from heat and add carrot/celery mixture. Distribute chicken mixture into individual ramekins. Roll out the puff pasty once or twice on a floured surface. Cut pieces to cover the tops of your ramekins. (I had four large ramekins so I cut four large circles.) Lay on the filled ramekins and press the dough against the sides with your hands. You want it to hang over the edge at least an inch. Cut 3 small slits in the dough on each pie. Place the pot pies on a cookie sheet. Beat an egg with a little water. Brush tops of pies with egg mixture. Bake for 20 - 25 min. until pastry is golden brown. My ramekins measure 4 inches round and 3 inches tall. I got four pies. If you used slightly smaller ramekins you could easily get 6 pies. You can, of course, use whatever veggies your family likes and they don’t have to be fresh. Frozen will work just fine. I don’t like a lot of different stuff in my chicken pot pie (like lima beans…ugh.) I kept the recipe simple by using only carrots, celery and onion. If you don’t buy rotisserie chickens, baking a chicken in the oven is an easy option. It also makes your house smell heavenly! Shop my favorite kitchen tools in The OSP Market! Ann, I have used this recipe multiple times with good results. Chicken and the puff pastry. Tastes delicious! These look so delicious! What would the instructions be to make one large pot pie? This recipe looks delicious and definitely one that my kiddos would love, too! I’m hoping to try it out this weekend! Thanks so much for all your wonderful posts…I really enjoy following along! The pot pies look scrumptious! I was just brainstorming what to cook in my new-ish soup bowls (the kind with handles on the sides, they are oven proof and I used them for French onion soup once). They will be perfect for this because they are a substantial size. To save time/dishes, I don’t take the veggie mixture out of the pan– just sprinkle them with the flour, stir and cook for a minute then add the liquid and stir well again. I also like to add a bit of fresh chopped rosemary, when I have it. I love your blue and white plates, Ann. Would you share where they are from? Where can I find these ramekins? Where did you find such deep ramekins Ann? We have girls night at least once a week. This recipe will make me look so domestic and clever. Thanks again,Ann. Perfect little pies! Just what I was looking for. Can I freeze a couple for another day? Is it possible to use Pillsbury crescent roll dough instead of puff pastry for the tops? Just a thought. Honestly Carole I don’t know if they would freeze well or not. I do think the crescent roll dough would be delicious too…enjoy! Thank you for the recipe! There is Is restaurant in Crystal Lake Il. They offer it in the winter time only and is delicious! I’m going to try your recipe! Thank you. Oh yes, we will definitely be enjoying this! It is what I seem to enjoy lately, simple but appetising. My hubby will love it because it doesn’t have peas! I use the rotisserie chickens for soup too. I’m going to try this recipe tonight. Thank Ann. The recipe looks so good and easy is a bonus….And I love,love,love that you don’t like lima beans. Me too. I think it is the texture as I don’t like hummus either. Glad to meet “cha! Making your wonderful lemon bread for Superbowl Sunday feast. It is now a family favorite. Hey Nancy…life is too short to eat things you don’t like…especially lima beans! Recipe sound delicious! Will definitely try this easy chicken pot pie recipe. Hi Jo…thank you for sharing my blog…I appreciate it so much! 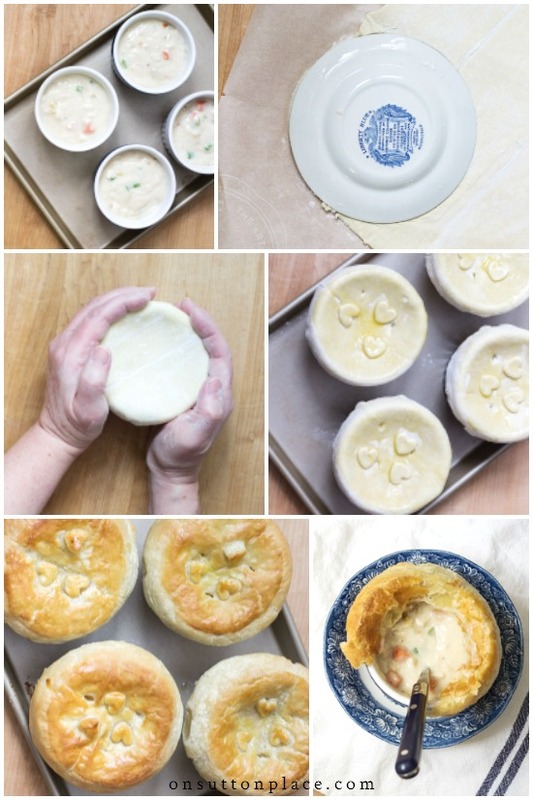 The potpies look amazing, I can’t wait to make them , yum! Ann, would you share where you bought your black flatware , love it. 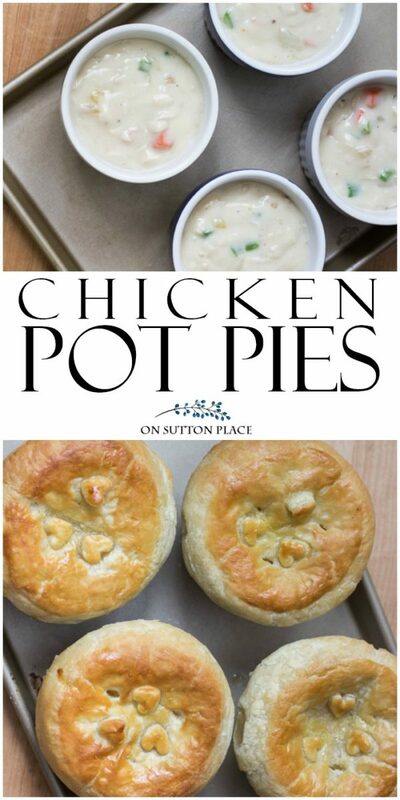 Thanks for stopping by…enjoy the pot pies! Sounds delicious and perfect for cold weather! Love the little heart designs on the top. Hi Ann, I am going to try this one. I never told you that I made your chicken noodle soup not too long ago. It turned out great. I added it to my recepie box. It is definitley a keeper. Love these easy peasy hot meals on a cold winter night. Stay warm and safe. Rotisserie Chicken is the base for many of the chicken dishes I serve. If you have never bought rotisserie chicken from Sams or Costco, you have really missed out. In my area they are $4.98 and are much larger than the ones from the grocery store! I will definitely be trying the puff pastry crust on my next chicken pie. Sounds delicious! Hi Nancy! Sadly the nearest Sam’s is an hour away and the Costco is even further. Kroger is right around the corner! If I ever do get to one of them I will definitely pick up a chicken. Thank you! I get my chicken from SAMs ! I have found that the chicken comes off so easy when hot! Also I use the puff pastry shells the recipe is on the box such a pretty meal. Great for a quick weekday meal!! These look & sound wonderful!